The Yorkie dog, also known by its full name, the Yorkshire Terrier, is the most popular of all toy breed dogs. Affectionate and playful, yet easy to handle due to their tiny size, these miniature mutts owe part of their popularity to their suitability to adapt to an apartment as a home. Yorkies, like many other purebred dogs and toy breeds, have very specific nutritional needs, which begs the obvious question, why don’t we feed them that way? Many pet owners, despite loving their animals feed them a generic dog food, unable to understand that certain breeds have different nutritional needs. So, what does that mean exactly? Well, let’s take a look. First of all, Yorkshire Terriers have small mouths. This means their kibble or dry food size will need to be suited to accommodate their petite mouths. They also have notoriously bad teeth, so appropriately-sized kibble is ideal as smaller bits will help scrape tartar off your dog’s small teeth, preventing tartar build-up that can lead to disease. A healthy mouth is the first key to a healthy body! Secondly, Yorkies are small but have extremely high energy levels. They need fuel to burn to keep up that playful pace! OK, so now you might be wondering how to determine which foods are appropriate for a high-energy playful dog. Some dogs, like Great Danes or other giant breeds, need food with lower protein and fat levels. This is because they metabolize food way more slowly than other dogs and also because they can, in fact, be “overgrown” when they are young. Yorkies, on the other hand, are high energy and playful, face no risk of being overgrown and are at low risk for weight problems. This means that they need high levels of crude protein, paired with high levels of fat and finally, healthy, high-quality sources of carbohydrates for both fiber and sustained energy. Finally, because they have such tiny tummies, Yorkies are prone to stomach issues. These can include digestion problems, as well as sensitivity related problems. It is extremely important to feed your petite pup high-quality food, free of harmful additives and ideally free of common dog allergens. Because of their tiny tums, Yorkies—even more so than other dogs—should have as many small feedings during the day as you can realistically give them (at least 3) to prevent an upset stomach. Protein: Crude protein should be the first ingredient on any dog food you buy. If you see something else as the first ingredient on the bag, just put it back. A diet high in protein will give your dog energy as well as allow the development of lean, strong muscle. Chicken, lamb, veal, and fish are all great sources of protein. Yorkie owners should be aware that chicken is an extremely common dog allergy, so if you notice hives or unusually itchy skin after changing your dog’s diet, chicken may be the culprit. High-energy dogs require high levels of protein, with a percentage in the high 20s to low 30s. Carbohydrates: High-quality sources of carbohydrates are important because they will usually include most of the fiber in your pup’s diet and because they are a slow burning source of energy. Not only will your dog feel fuller, longer, but he’ll be able to play all day! Good sources of carbs include ground flaxseed, peas, and sweet potato. Fat: Although humans avoid them like the plague (they shouldn’t) healthy fats are great for your Yorkie! You can go for a high percentage here too, as weight gain isn’t a huge problem for Yorkies generally. Besides giving your Yorkie fuel to burn off while playing, fats are great for keeping your pup’s coat shiny and smooth and his skin moisturized. Hypoglycemia: A condition that can be managed by medication, hypoglycemia is a thyroid condition that can cause lethargy and weight gain. Collapsing Trachea: Yorkie’s can suffer from a collapsing trachea. Although it can be treated with surgery, including glucosamine and chondroitin in your dog’s diet can help him avoid this condition. Legg-Calve-Perthes Disease: This disease involves degeneration of the rear leg bones. It can affect even puppies. You will notice lameness and pain in your dog’s rear quarters. As mentioned above, Yorkies have small mouths and should only be fed food specifically formulated for small breeds. Small kibble sizes also help keep your dog’s mouth healthy by scraping tartar off your pup’s teeth. Also, because Yorkies have tiny stomachs and are prone to hypoglycemia, feed them lots of small meals throughout the day instead of one big one. This Blue Buffalo dry dog food is formulated with a smaller dog in mind. Smaller animals often have more energy and their nutrition needs to reflect this. This Blue Buffalo formula has higher levels of protein, as well as higher quantities of carbohydrates to help your Yorkie meet these needs. 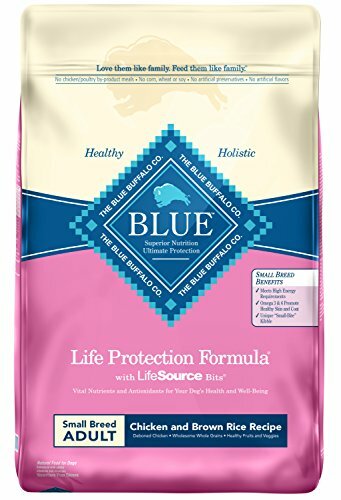 Like most of Blue Buffalo’s line of dog food, it comes with patented life source bits. These meaty treats within the dry kibble provide concentrated levels of vitamins, minerals, and antioxidants. This mixture helps your pup maintain a healthy immune system while the Omega-3 and 6 acids to help keep your dog’s coat shiny and skin healthy. This formula also contains glucosamine for healthy joints and the small kibble size is ideal for helping scrape tartar off the teeth of a small dog, resulting in better oral health. The bottom line? Chicken sometimes causes a reaction in dogs, but if your dog has no such allergies, he’ll love this food! It’s formulated for small dogs, meaning it has more protein and complex carbs to help meet your pups energy requirements and glucosamine and antioxidants to ensure your dog stays healthy into old age. This high-protein formula has a smaller kibble size, ideal for a small breed dog. This small kibble size is also beneficial to your dog’s oral health, as it will help scrape tartar off your pup’s teeth for a cleaner mouth. This dry dog food has prebiotics and probiotics for good gut health, as well as promoting healthy digestion in your pet’s tiny tummy. This formula is also appropriate for a small dog’s high energy needs, containing high levels of protein and packed with high-quality carbs. This formula contains no chicken, which can be a trigger of canine allergies and also no grain, which is a common a common source of dog allergies as well. The bottom line? Small dogs love this tasty food. This dog food is based on their ancestral diet and is comprised of high-protein and high-fat levels, as well as healthy complex carbohydrates. This anti oxidant formula will also benefit your dog’s oral health by allowing tartar to be scraped off the teeth. This small breed, adult kibble contains no wheat, soy, corn, or artificial flavor or coloring. This high-protein, high-fat formula is ideal for a small dog’s energy needs. It also has healthy sources of carbohydrates such as brown rice and barley for fiber and slow burning energy. This delicious dog food has small kibble sizes, which promotes oral health by allowing your dog to scrape disease-causing tartar off his teeth. It also makes it easier for your minute mutt to eat! It is also enriched with pre and probiotics and chicory root to be gentle on your dog’s tummy. Enriched with Omega-3 and 6, this food will give your dog a silky smooth coat and promote healthy skin. It is also packed with antioxidants for optimal immune system health. Users claimed small dogs loved it and some even proclaimed that their dog finally ate this food without them having to entice it by enriching the food with extra treats and tidbits. 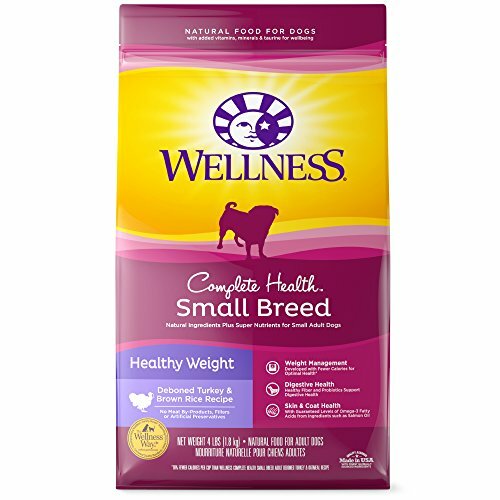 This dog food is also appropriate for dogs needing weight management. The bottom line? This tasty food will be gobbled up by even the pickiest eaters. Ideal for weight management and formulated with a small dog’s energy needs in mind, Wellness Complete will also keep your dog’s teeth, coat, and tummy happy! This inexpensive dog food was created by expert nutritionists, especially for a small dog’s needs. This food contains high-quality sources of protein and carbs and is an ideal formula for weight management. Substituted calcium and phosphorous help support the growth and maintenance of healthy teeth and bones. This dog food is enriched with Omega-3 and 6 for optimal skin and coat health. It also has added taurine for healthy eye and heart function. This premium quality dog food is appropriate for all life stages—from puppy to adult and contains no artificial colors or flavors. The kibble sizes are also ideal for a small mouth. Users also revealed that this dog food appeals to even the pickiest palate. The bottom line? As long as your pup does not suffer a chicken allergy, this appealing food could be a fantastic option for your Yorkie. Not only does it have high-quality sources of carbohydrates and fiber for a happy gut and sustained energy, the protein and fat levels are ideal for this food to be used for weight maintenance too. It also promotes skin, coat, bone, heart, and eye health. Surprisingly, this premium quality dog food is also one of the cheapest on our list. What more could a pet parent want? This small breed dog food is grain free and contains no wheat, soy, or corn. This premium dog food also contains no preservatives, artificial flavors or colors, and no meat by-products, perfect for a pet prone to reactions. 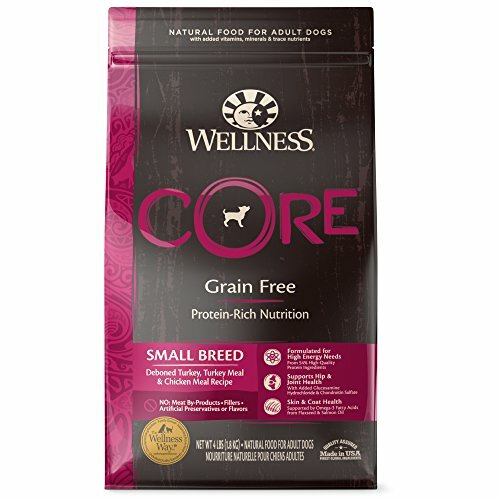 Wellness Core contains live pre- and probiotics to help your dog digest and for a happy, healthy tummy. It also contains fatty acids Omega-3 and 6 for healthy coat and skin. Real fruits and veggies are natural sources of antioxidants, creating a strong, resilient immune system. High levels of quality protein and complex carbohydrates ensure weight maintenance and healthy, sustained energy sources for your small dog. It is also enriched with glucosamine and chondroitin to help with longevity in terms of joint health. The bottom line? 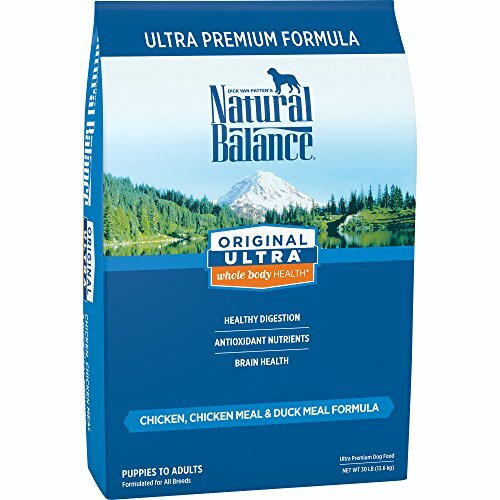 Although this product contains chicken, it is formulated with the dog with food sensitivities in mind. Free of all fillers and anything artificial, this high-quality dog food promotes healthy skin and coat, as well as joints and a healthy immune system. The best food for your Yorkie will literally be a matter of taste as all of these foods are fantastic options for your small pet. Hopefully, this review has been helpful in finding the right food for your petite and particular pet! Glad to hear that you’ve consulted with your veterinarian. Keep visiting your veterinarian so that your Yorkie can be weighed to see if he is gaining weight. Also keep feeding him baby food according to what your veterinarian is advising you. Your veterinarian will also advise as to what wet food to feed, and when you should do so. That said, you have not mentioned the pup’s age in your comment. Hope this helps! Keep us updated! I have a 3 year old, 3.5 pound, Yorkie who is very finicky. He will not eat the Blue Buffalo Small Breed Chicken and Rice. His brother, who is 1 year old and is 7 pounds has no problem eating. The breeder said he was fat and to get him Blue Buffalo Small Breed Weight Manangement. Now I can barely get him to eat.They will go all day without eating. So I tried addicting Stella & Chewys freeze dried treats crumbled up and mixed in. They nosed around and only eat the treat, not the good stuff. I’ve tried adding Blue Buffalo canned food, same thing. My husband said, “Just lay the food out and pick it up after 15 minutes, several times a day. Then they will eat.” I leave it out All day and they still don’t eat. I’ve even gone as far as putting both dogs on the couch and saying, “One for Riley,and one for Jaxon. This is getting crazy. Can you help me? Welcome to the world of Yorkies! Picky eaters with feisty temperaments.Awesome dog breeds! Try addding some warm (not hot) beef or chicken broth to the kibble. You could also add some steamed chicken or salmon with veggies. Perhaps switch dog food brands to another high-quality dog food formulated for small dog breeds. Dogs are like people, and some may be tired of the taste of a particular kibble if they’ve been eating it for a while. Opt for formulas that offer real, natural ingredients such as fresh chicken, whole greens, and berries. The top- five ingredients listed are very important. Vary by alternating chicken, beef, duck, salmon and venison cans. They may pick a favorite if you’re lucky! Good Luck! Thanks for connecting to Mysweetpuppy.net. Please keep in mind that I, Claudia Bensimoun, do not write any of the blogs or reviews on this website, nor have I in the past. I only answer the comments section.You can find the cost if you click on the Amazon links (within the blog) to the product.They do come in small bags, and are very cost effective. Some dog food brands will also offer sample bags, enabling you to see which ones your dogs prefer. Keep in mind that a high-quality dog food is best (4 or 5 stars). The dog food should be appropriate for your dog’s lifestage, medical conditions,and breed. As usual consult with your veterinarian as to the best dog food option for your pooch. Your vet will have your dog’s medical history on hand, and will advise you on which dog food formula to purchase. Thanks again for reaching out to us!